Preheat oven to 350 degrees F. Grease or spray your loaf pan. Beat sugar, eggs and oil until fluffy. Beat in bananas and vanilla. 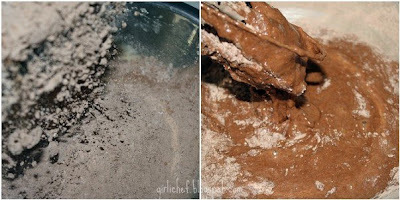 Combine flour, cocoa powder, baking soda and salt in seperate bowl. Beat into wet ingredients until just combined. Spoon into prepared loaf pan. Bake for 45 minutes. Transfer to wire rack to cool. I liked it warm...mmmm. 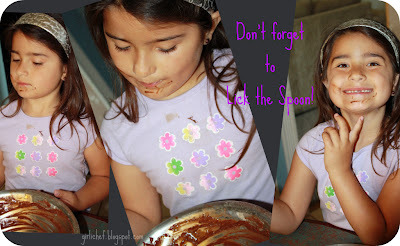 Be sure to pass your mixing bowl and spoon to someone to make sure it's cleaned up really well before washing ;) ...and don't forget to eat your greens (and then send me a link)! I like banana bread....and make them also quite often. But haven't baked one with chocolate yet. I love to eat them for the breakfast! Yum! Looks fabulous! I just discovered The Sisters Cafe the other day. Great blog! This really does look fantastic. I also love the model you're using for advertising :-). She's a cutie. I am always amazed that you can bake, cook and take photos all at the same time!! I have come to the conclusion that I can not multi-task. I absolutely love all the photos with your blog. Now on to my greens! Mmm, I bet this really was good warm! Man! I would have this for dessert any day! Looks incredible! I love the combo of bananas and chocolate! I'm drooling! great advice about knowing your oven and trusting your instincts. I always hear about people who had disastrous results because they follow recipes too precisely (and then blame the person who created the recipe). I'll have what you're having...it looks divine! Look at all that chocolately moistness! Ooooh la la!! Your cake tester is a sweetie as well! I LOVE the idea of this! I devour my chocolate chip banana bread (slightly undercooked as usual :) ) but being a chocoholic I'm shocked I haven't thought of this! You daughter is cute. Bread for dessert. Why...yes please! !Besides who could say not to chocolate in bread, right? this will work for dessert, for breakfast, for lunch, for dinner. For after midnight snack. Can you tell I like it? Love bananas and chocolate together in breads. Also love the photos! 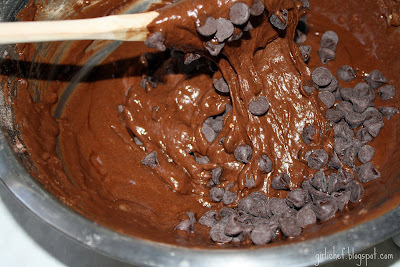 I just finished some Italian brownie-muffins and my 20-year old daughter and 22 year-old son had to lick the bowl! I'm not a chocolate fan (weird... I know!) but it does look good!! Holy crap. My girlfriend is making banana bread tonight, I wonder if I can convince her to do that! It looks amazing. That looks so moist and delicious. I find banana bread one of the hardest things to get perfect. I'm putting all the baking on hold till it chills out a bit. Yum! This is my kind of dessert! This cake looks a little bit tooooo delicious! I would like to join in on the BSI assignment.. Sounds fun! Especially after gaining a virtual 15 pounds looking at that dessert! This really looks bowl licking good!Chocolate and banana together is a great combo! YUM!! Guess what? I have exactly TWO old bananas ready for baking. YES! Tasty looking banana bread and adorable photos! Oh yeah! Love bananas and chocolate. This looks delicious! 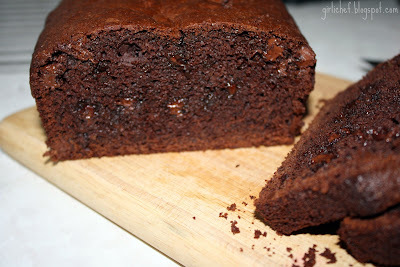 Oooh, this looks so moist and chocolatey- incredibly delicious! Wow, that bread looks so chocolatey and moist and delicious! I would have it instead of dinner :) Yum!!! It looks so moist and tender. Yummmm. I'm so glad you liked it!!! My husband took a slice for breakfast EVERY day for the entire work week!!! The next time I make it, I think I'm going to try baking it a bit less...I would have liked it a little more moist...it seemed to get a bit more "browned around the edges" that I typically like. Yours looks great! Uhhhh why do folks insist on doing this to me BEFORE breakfast? I also posted your "button" on my sidebar. I love them. It really does look super moist! Definitely dessert! wow i love banana bread, never tried to bake one though!! Looks super moist! And nice clicks too!! Ohh my goodness!!!! !that is just sooo very moist!!!! I think I'd have some for breakfast the next morning, too! WOW now this is a loaf of heaven. I girls would love for me to make this for them! Me too!! Pass me THIS bread,and I can eat it the whole day!! This really is the perfect dessert, YUM! Your little girl is adorable! "So, know your oven & trust your instincts." That's great advice! Your bread looks awesome, Heather. I read this when you first posted it - I'm not sure why I didn't comment! I think I was putting your badge on my site and just forgot to. 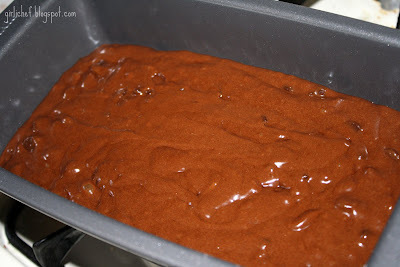 But this looks super moist and so delicious! I've made tons of banana breads and have never combined them with chocolate. I'm kicking myself for it now! How delicious! 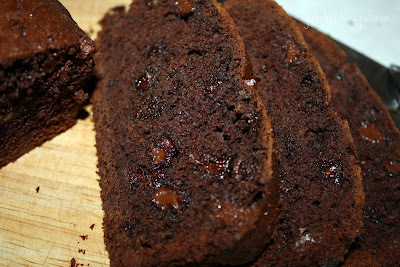 I love chocolate bread and adding sea salt mkes it perfect! This sounds like a great quick bread! I will make it. I have a bad relationship with banana bread (it never turns out) but this recipe looks great! This is my FAV way to use up over-ripe bananas!! the choco-banana combo is awesome! Now THIS is chocolate-y! 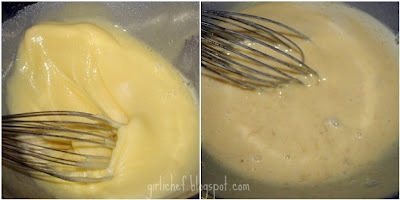 I would've been hard-pressed not to start eating the batter as soon as the choc chips went in. The aroma from your oven must have been heavenly . . .!